The University Archives is maintained and managed by the Library with the purpose of documenting the functions of Point Park University and its historical and cultural significance as an institution of higher learning. The primary responsibilities of the University Archives are to appraise, acquire, organize, and preserve Point Park University material of historical value. It is the goal of the University Archives to maintain records that are open to the Point Park community for research, publicity, and instructional needs. The Archives contains University yearbooks, documents, images, student newspapers, photographs, catalogs, the Point Park College 25th Anniversary Oral History collection and much more. Point Park University Archives also participates in Historic Pittsburgh which is an online collection of archival material from various local institutes. Point Park's collection consists of archival photographs representing the dynamic life of Point Park University and the surrounding Downtown Pittsburgh area. For information, tours, or to view archival material please call (412) 392-3171 or email library@pointpark.edu. 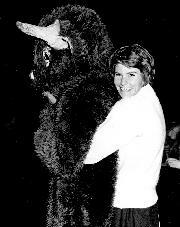 The image above depicts Point Park College's mascot "Black Diamond - The Bison". This photo was taken at a basketball game in 1967-1968. 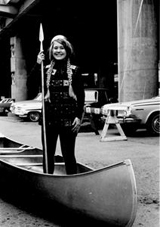 During the 1960's - 1970's Point Park students held canoe races down along the Monongahela where they occasionally dressed in costumes. Pictured above is one of these "Viking" students. 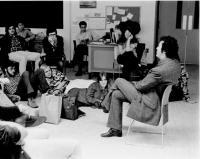 In the picture above students sit and listen to a lecture on Cinema and Photography.